Ready to join our 100,000+ readers and make the most of your vacation time? Our monthly newsletter is packed with our newest articles, travel tips, links from around the web, and more, and it's delivered directly to your inbox! 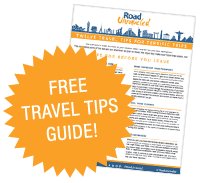 Subscribe today and we'll send you our favorite Twelve Travel Tips for Terrific Trips for FREE! Please enter your email address below, check the "Email" box, then click Subscribe.